The iPhone 4 (s aapl) is arguably the first one anyone would be interested on putting on a tripod, and that’s exactly what Tom Gerhardt and Dan Provost were counting on when they designed the Glif, a dead simple iPhone 4 universal tripod mount. The Glif was funded using Kickstarter, a platform that allows individuals to pledge contributions of various sizes towards a funding goal, usually in exchange for some reward promised by the designer, artist or engineer seeking funding in the first place. Like the TikTok and LunaTik iPod nano watch kits funded through the site, the Glif exceeded its funding goal, and is now available for purchase. But is it worth the $20 asking price? As you can see in the gallery below, the Glif is incredibly simple, and features no moving parts. It’s a single pice of injection-molded plastic, with a 1/4-inch thread mount that’s compatible with any standard tripod head. It’s very small, and weighs virtually nothing, so carrying it in a pocket or an accessory pocket on a laptop case is no problem. Also, since it has no moving parts, it’s very unlikely to break under normal use conditions. In a world of increasingly complex and complicated iOS device accessories, the Glif is a breath of fresh air. It doesn’t have any obnoxious branding, and it has an economy of design on par with Apple’s own governing aesthetic. I worried that this design wouldn’t allow me to use the Glif in tandem with a Gorillapod while suspending the iPhone 4 upside-down. As you can see from one of the photos in the gallery before, that wasn’t the case. But I still wouldn’t necessarily recommend using the Glif like this, since if your setup gets bumped or knocked, the phone could conceivably come loose. For all other uses, however, the Glif is fantastic. It helped me take great shots in low light on both my standard tripod and using a Gorillapod SLR. It was easy to get on and off the tripod mounts, and it keeps a firm grip on the iPhone while you’re manipulating the angle of your shot or switching from portrait to landscape. Finally, even in its secondary capacity as a stand, the Glif is quite capable. In portrait mode, the Glif cuts into the screen slightly in the bottom corner, but for FaceTime it doesn’t really impede usage. In landscape mode, it works great for watching video, and the angle is just right for FaceTime, too. For $20, the Glif is awesome. I had been using the Gorillamobile designed specifically for the iPhone 4, but if you already have a previous generation Gorillamobile, the Glif will work with that, saving you some money. Plus, it’ll also make your iPhone compatible with any other tripods or camera mounts you happen to have, which isn’t something the iPhone 4-specific Gorillamobile offers. As if it wasn’t enough that the Glif does its job so well, it also comes in packaging so minimal you’ll be shocked (see photo below), is completely recyclable, and is actually manufactured in the U.S. You just can’t find a better iPhone 4 accessory than the Glif for $20. 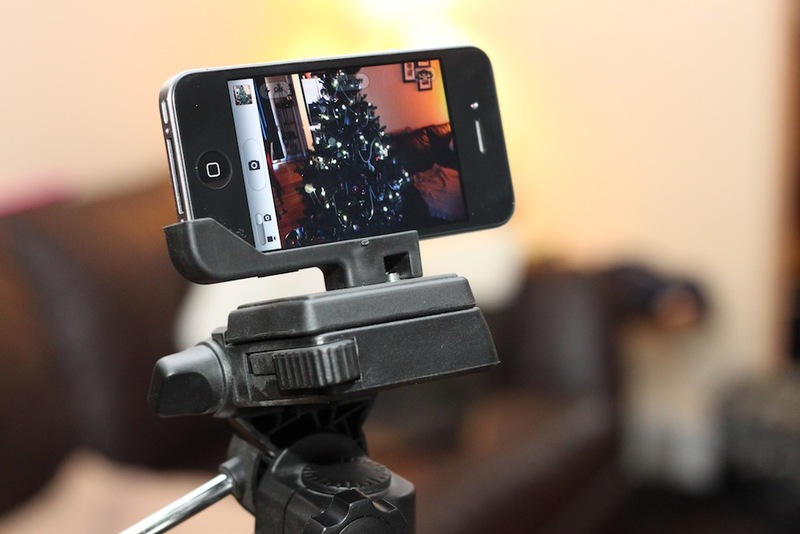 Wow, this Glif iPhone 4 Tripod Mount is amazing. I think this might just be a perfect gift for someone. Thanks Darrell. Love this thing and would like to buy one. The only thing that worries me – if I’ll put my iPhone on and off this thing pretty often – won’t it finally leavy a trail (scratches) on the body of the phone ? Or go loose over time ? The Glif is great as a tripod mount but it’s real day to day usefulness is as a stand. I love it it for reading the paper, or watching a video while I have breakfast. Couldn’t agree more – ordered one for myself, and after seeing how great it as (was a little skeptical based on the promotional photos and videos), I bought 5 more as christmas gifts for friends. Photography seems to have grown with ip4 (arguably because of camera+ and instagram) so its a great gift for others. I’ve used it every day since I got it, whether it was to take a photo or prop it up on my desk while working. Great product, thats for sure.